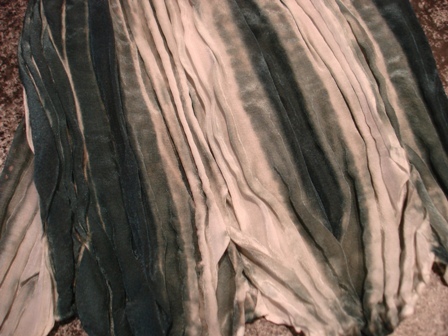 The Seaview Weavers’ Guild program this month was Cheri Bridges teaching us Japanese arashi-style shibori dyeing. 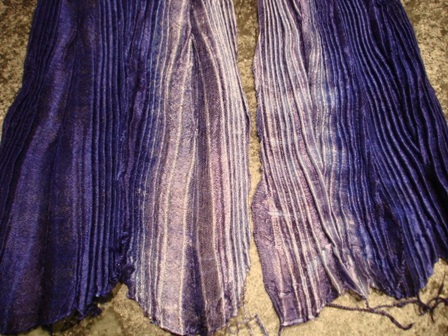 This is also called pole-wrap dyeing — the cloth is folded, wrapped around a pole, bound with a string, then scrunched down to make pleats. 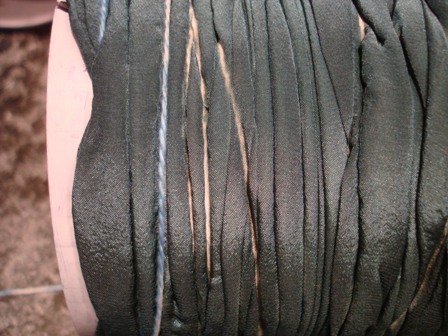 This bundle is then soaked in dye, left to dry completely, then unwrapped. As Cheri said, “Let it get bone dry, then wait another day.” This was hard — I really wanted to see how it lo0ked. But the extra time helps set the pleats, so I resisted temptation. Sorry about the blurry picture! But I was too eager to unwrap these to check the photo before moving on. Here’s one scarf, with the string partly undone. 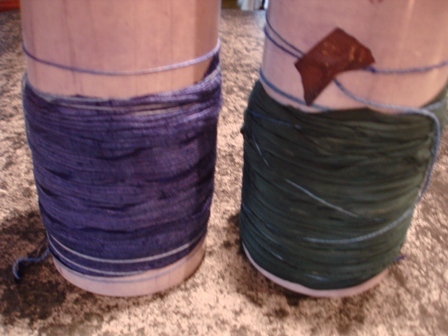 You can see that the string acts a resist, keeping the dye away from the fabric. The string picked up a bit of dye, so is blue, the white lines are where the string was. The folds and pleats also act as resists. 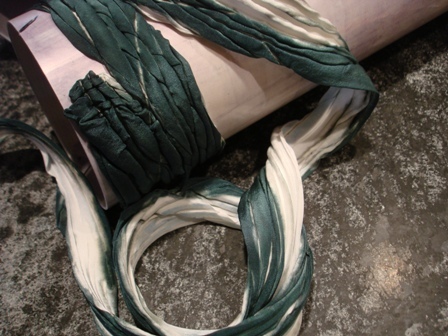 This scarf was white to begin with, then dipped in a black dye solution — the result is greenish grey, perhaps there wsn’t enough dye in the bucket for the number of scarves we put in. I just love the color gradations and pleats!